All right, to start off, please introduce yourselves. 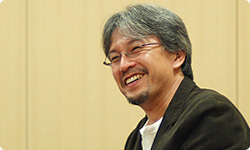 I’m Aonuma, from Entertainment Analysis & Development. I produced this game, The Legend of Zelda: Spirit Tracks, and I also produced the previous game, "The Legend of Zelda: Phantom Hourglass" 1. 1 Phantom Hourglass is “The Legend of Zelda: Phantom Hourglass”. It is a stylus-controlled action-adventure game, and the first Nintendo DS title in the Zelda series. It was released in June of 2007 in Japan and in October of 2007 in Europe. I’m Iwamoto, of the same department. I acted as director for this game, as with the previous game. 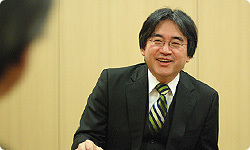 Aonuma-san, you’re involved with both the Wii and DS editions of "Zelda". Are there any differences in how you work on the two? When I work on the Wii edition, I’m right on-site, and I often do my job from a director’s perspective. On the DS version, I do proper producer’s work. …That said, when I worked on the previous game, Phantom Hourglass, I was simultaneously making "Twilight Princess" 2 , so I couldn’t keep a very close eye on things right from the beginning. Then, when Twilight Princess was finished and I went to the DS version’s office, the development was already pretty far along. From my point of view, it was at a stage where I could really make myself useful. 2 Twilight Princess is “The Legend of Zelda: Twilight Princess”. It is an action-adventure game that was released in December of 2006 as software for both Wii and Nintendo GameCube. So you’re saying that you left the site for a while, and that let you see the DS version with a new set of eyes. As a result, you were able to spot the places where you could put in a little more work and really improve things. That’s exactly it. So then – and I did feel bad to do so – I asked that development be extended three more months, and I worked on it during that extra period. Then, the more I worked, the better it got. Yes, I’d heard something about that, too. I heard that the quality of the previous game improved tremendously during the final stages of development. As you’d expect, I went back in right in the final stages of development, as I had with the previous game. I’d lobbed out several proposals, and when I came back, the results I’ve gotten were far better than I’d hoped for. I think I must have played the game through about ten times from there on. (laughs) I was making the final balance adjustments. The producer says it was far better than he’d hoped for. Director Iwamoto, how did this project begin? Even though you’ve done all you could (laughs). You see, though, I did feel the same way. In the previous game, there was a tremendous amount of ideas, and even I felt very strongly that we’d done absolutely everything. Since you both felt that you’d done everything there was to do, what made you decide to make another Zelda for DS? Well, there are some definite similarities between that sequence of events and the way Majora’s Mask 3 came from Ocarina of Time 4. 3 Majora’s Mask is “The Legend of Zelda: Majora’s Mask”, a Nintendo 64 game. It was released in April of 2000 in Japan, a year and five months after Ocarina of Time appeared. 4 Ocarina of Time is “The Legend of Zelda: Ocarina of Time”. It was the first game in the Zelda series to be made in 3D. It was released in November of 1998 in Japan for the Nintendo 64. That’s right, the situation now is similar to the way things were with the Nintendo 64. Very similar. If I start telling that story, though, we could be here for a while. Is that all right? Of course, please, go on. I doubt it’s even possible to talk about Zelda theory without mentioning that story. All right. Our first 3D Zelda game for the N64 turned out to be Ocarina of Time. I did some direction on that one, although it was only partial: I was in charge of dungeon design. 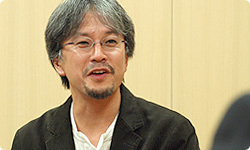 Somehow, I had the impression that you’d been overseeing everything since Ocarina of Time, Aonuma-san. Now that I think about it, I guess that wasn’t the case. Well, and they pretty much let me do whatever I pleased. So when we made Ocarina of Time, I felt very strongly that we’d given it our best. When Ocarina of Time came out, people said it was far above the average level of games at the time, so I’m sure you did feel you’d done your best. That’s right. It made us very, very happy (laughs). Even after its release, I felt that we’d really done something special; I felt very fulfilled. At the time, I think (Shigeru) Miyamoto-san had that same feeling, but apparently he also felt as though there was still quite a lot left to do. And so he said: we’d already made 3D models for Ocarina of Time. By changing the situation, couldn’t we make new ways to play, a new story? So you made Majora’s Mask. No, we didn’t just start making Majora’s Mask, not right away. There was actually a flip-side, and in the beginning, the idea was to make a “Ura (Flip-Side) Zelda”. That “Ura Zelda” (Ocarina of Time: Master Quest) was developed for the 64DD5. Ultimately, we recorded it on a limited edition disc that went to people who pre-ordered The Wind Waker6. 5 The 64DD was a Japan-only Nintendo 64 peripheral sold by RandnetDD. Service began in 1999 and ended in 2001. 6 “Limited Edition Bonus Disc”: A limited-edition bonus distributed to those who pre-ordered The Legend of Zelda: The Wind Waker, which was originally released in December of 2001 in Japan and in May of 2003 in Europe. It was a GameCube disc that contained Ocarina of Time and Ocarina of Time: Master Quest. Ultimately, other staff members handled Master Quest. Still, as someone who has been in charge of the dungeons, I just couldn’t get that excited over making a flip-side for them. I couldn’t see it turning into a new Zelda, either. But we’d been told to make Zelda. It isn’t as though we could just say, “I don’t want to”, and end it there. At that point, Miyamoto-san gave us a trade-off: he said, if we could make a new Zelda in one year, then it wouldn’t have to be a “flip-side”. Yes. That was the deal. But Ocarina of Time did take three years to make, you know!? And we were supposed to make its sequel in a year… At first, we had absolutely no idea what sort of thing we were supposed to make, and we just kept expanding our plans… At that point, the “Three-Day System”7, the idea of a compact world to be played over and over again, came down from Miyamoto-san and one other director, (Yoshiaki) Koizumi-san8. We added that to the mix, and then, finally, we saw the full substance of a Zelda we could make in one year. 7 The Three-Day System: In this system, after three days of in-game time, the moon falls to earth and the world is destroyed. For that reason, the player must control that time and advance the game while repeating those three days, over and over. 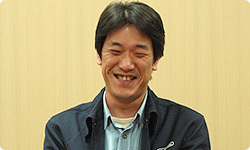 8 After Majora's Mask, Yoshiaki Koizumi was involved in the development of Super Mario Sunshine (2002), Super Mario Galaxy (2007), and other 3D Mario games, and in the Nintendo DSiWare application Flipnote Studio (2008 in Japan, 2009 in Europe). He is affiliated with the Tokyo production office. That’s correct. (laughs) Still, in the beginning, it was all trial and error. Ultimately we adopted the “three-day system”, and made it so that, if you couldn’t clear the game inside of three days, the world was destroyed. It turned out to be a very tense game, didn’t it? Then, in Majora’s Mask, you had to remember all sorts of things so that the world wouldn’t be destroyed: “Oh, there was something here, and something else over there”, things like that. That’s another thing it shares with Spirit Tracks. You’re travelling by train, and if you’re careful to remember where things are, they come in handy later. And this time, since it’s on DS, you can take notes.